“How does he do that?” If you caught rising star DJ-producer AraabMuzik at Coachella recently, or when you catch him at Sasquatch, Summer Camp, or any number of other festivals this summer, then you’ll know that question follows the man around. Touring on the strength of Electronic Dream, his excellent 2011 album of spacy, Euroclub-tinged instrumentals, the sampler wizard born Abraham Orellana has become a must-see live act on the strength of his fleet-fingered workouts on the MPC2500. We caught up with the self-proclaimed “MVP of the MPC” on his way to a gig, and got the low-down on his influences, work ethic, and what’s next. What artist or producers did you grow up listening to? I listened to a lot of Dr. Dre, a lot of Swizz Beatz, a lot of J Dilla, a lot of DJ Premier, Just Blaze. I was always listening to a lot of different styles and sounds. Just studying. Being influenced by them didn’t mean that I was trying to sound just like them, it was just knowing that they could do it meant that I could create my own music. I started around 11, 12 years old. I’ve been making music ever since. Was there one song or beat that made you want to be a producer? No, because being a musician, I didn’t want to just stick to playing one thing. I was a drummer since I was a little kid, and I wanted to move on and play other instruments. I started playing piano, I started learning keys and chords. I started creating little beats. I was recording on tapes, all types of beats, and then I moved on to learning how to sample. I started learning how to take bits and pieces of anything that caught my ear. And that’s when I got the MPC, and I was able to do everything hands-on, because there’s no software needed, there’s no click-and-drag [laughs]. I could freestyle anything on the spot, how I do now. Are there producers working right now that you’re listening to? I don’t really listen [to other producers]. If you consistently make good music, then I’m a fan. Consistency is pretty much what I pay attention to. There are a lot of different producers that want to expand, and show their other sounds, but they drop hundreds of songs with the same style of beat, and now that’s what they’re known for. But you’ve got to put your foot down. You’re the producer, at the end of the day. Flip it up on ‘em, you know what I’m saying? You’ve avoided getting pigeon-holed by releasing original tracks rather than strictly remixes, like the songs on Electronic Dream. Is that something you want to do more of? I want to drop another album, but it’s not going to be like Electronic Dream. With the next one I want to switch it up. The same feel, but still something different. Nowadays, everyone is sampling, everyone goes sample crazy. It’s cool to do that, but it’s original and it’s not original at the same time. And with sampling, you’ve got to pay a lot of people for what you use. I try to stay away from that now, because the more original work you do, the more you get. What’s the status on your collaboration with A$AP Rocky? I’m on tour, he’s on tour, and he’s putting an album out in July, so we’re just taking our time with it. Can’t rush greatness, you know? I mean, I’ve got stuff on the A$AP album coming out [LongLiveA$AP], so once that comes out, then maybe we can focus on [collaborating]. But obviously he’s focused on his album right now. You’ve also been working with The Weeknd. What’s that process like? He just wants my music. He doesn’t want me to make R&B or some ballad, he just wants AraabMuzik. He’s not trying to have me make the beat that he is known for getting on. So that’s going to be real tight. I’m on a lot of different albums and projects, but I’ve got to wait until they decide to put it all out. 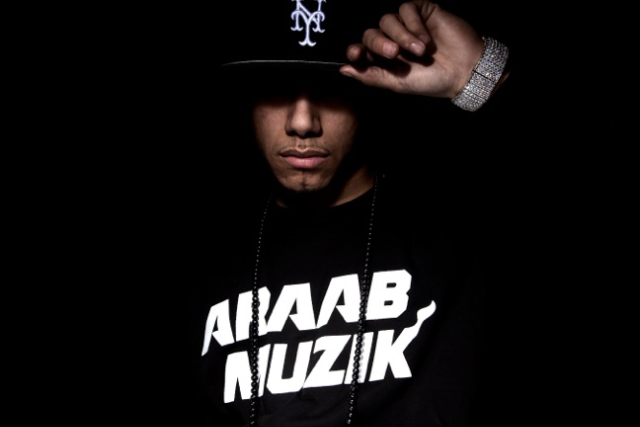 Same thing with [new AraabMuzik single] “Street Knock,” the video should be out early May. And hopefully that makes more hype and that makes more money, right? [Laughs] But I’m having fun with it, I’m not doing this for the money.